These are the photographs that were taken during Elira and Paolo’s wedding. The wedding took place entirely at Osteria La Madernassa Guarene, near Alba. Elira and Paolo live in Sweden, in Stockholm. A rather cold place, but the event that celebrates their love is full of warmth! It is early in the morning when Paolo gets ready at his parents´ place, not far from the location of the wedding. Meanwhile Elira is getting ready in the fantastic suite of the Hotel Palazzo Righini in Fossano. 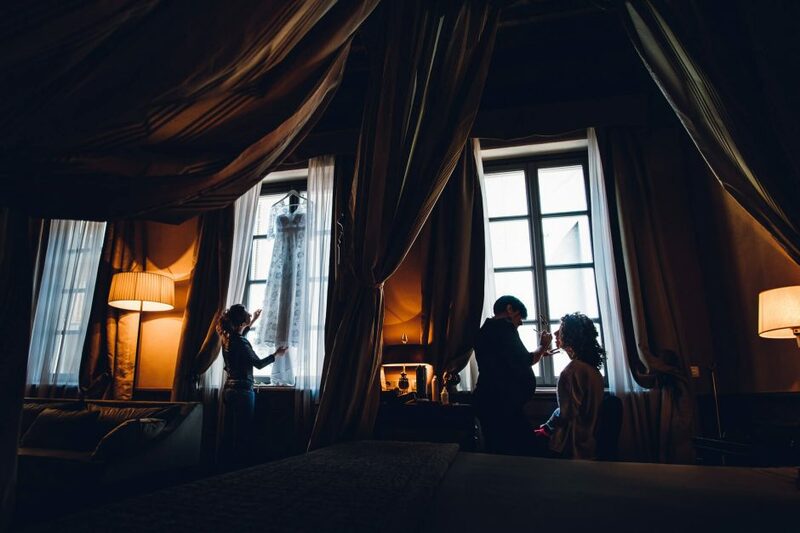 We thank Palazzo Righini for letting us using this fabolous room, which gave us the opportunity to take pictures really out of the ordinary, giving an added value both to the experience of the bride and the photo shoot! The wedding takes place entirely at Osteria La Madernassa Guarene, one of the top locations in Langhe and Roero, a starred restaurant, a very good example of Piemonte’s excellent enogastronomy. The reception of Fabrizio and his wife Luciana is always extraordinary, it is always a pleasure and an honor to work here. Everything is ready for the ceremony, outdoors in one of the gardens of the location. Better than any words, the images show the great emotions of this moment, both for the spouses and for the families (his from Italy, hers from Albania). The great cuisine of Osteria La Madernassa offers a delicious menu. Everyone makes their contribution for a cheerful atmosphere: aperitif and lunch are full of moments of fun and emotions. A Swedish friend from Stockholm holds a speech fluently in Italian. Even the newlyweds propose a game to their guests, a quiz in the garden with questions concerning the couple. During the day we also find the time for some portraits with Elira and Paolo, beautiful, in love, in a special place for an unforgettable day. La Madernassa, as well as having many comforts, is also one of the locations in Piedmont with a swimming pool: another scenery for photos that show the joyful mood of the party. Finally, the launch of the bouquet. And then we print the photos “take away”, which are snapped up by the guests, and this is always a great satisfaction. Let’s carry on with the dance: spouses, friends and parents, to end a fabulous day for Elira, Paolo and their guests.